The new system applies phosphite to cotton crops engineered to express a certain gene—a gene that makes cotton able to process the phosphite into nutrition while the same compound suppresses weeds that are unable to use it, researchers said. "Selective fertilization with phosphite allows unhindered growth of cotton plants expressing the ptxD gene while suppressing weeds" is the title of a Proceedings of the National Academy of Sciences journal article to be released the week of June 4. Phosphorus is a major element required by all living beings—life is not possible without it. Most organisms can only utilize phosphorus in the form of orthophosphate. 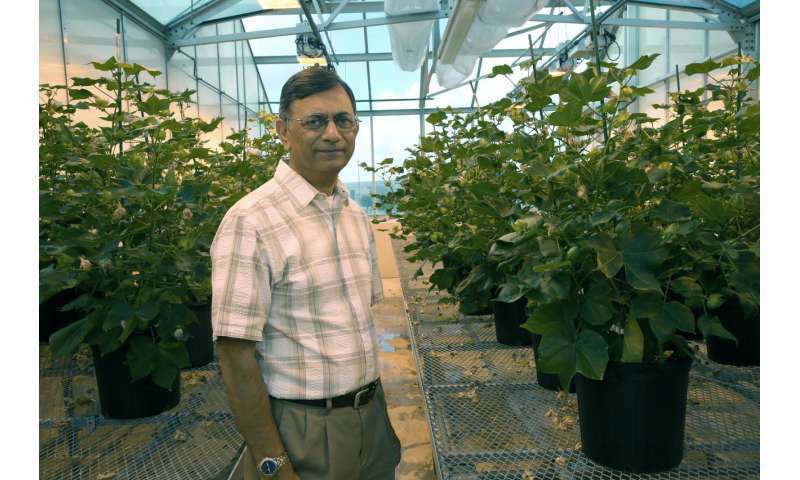 "In order for a weed to acquire the ability to utilize phosphite, one of its dehydrogenase genes will have to undergo a complex array of multiple mutations in its DNA sequence—that's unlikely to happen by random mutations that occur in all organisms," Rathore said. It seems odd that they use the term "suppression" with respect to the weeds. That has a negative connotation that they should be trying to avoid. If I understand this correctly, what they have is a selective fertilizer that only the GM cotton can gain any benefit from. (What a racket - proprietary crop AND matching fertilizer!) This is not a weed killer, the weeds are simply not fertilized; they go hungry. Seems like this is a great strategy. The weeds aren't under attack by something trying to kill them, so I would expect less pressure to mutate. I would think the weed's inability to process the fertilizer would also leave more for the cotton, so less would be needed. The inability of algae to process the stuff is a big plus in terms of avoiding blooms, a real problem in lakes around my neck of the woods. I do wonder then, what is the consequence of higher levels of this in lakes and rivers and what does finally degrade it?